This page is for the original release. 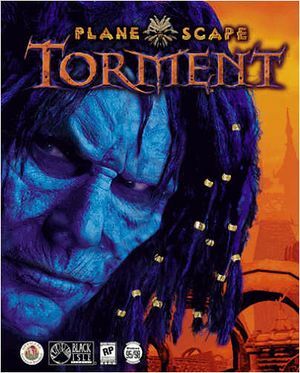 For the remastered edition, see Planescape: Torment Enhanced Edition. 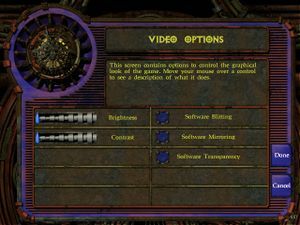 Bundled with Planescape: Torment Enhanced Edition. The Official 1.1 patch is essential. GOG and 2 CD disc copies will already have this installed. There are several recommended mods containing bug fixes, widescreen support, restoration of cut content content and tweaks to some of the more annoying aspects of the game (such as the hit-points per level being constant instead of completely random). It is recommended that you follow this guide, as the mods require that you install them in a certain order. GOG.com version users can skip to step 3a. Use Widescreen Mod (mirror). Game elements will be too small or zoomed out at very high resolutions, even with UI Mod. 30 FPS default cap (40 for GOG.com). See 60 FPS. Higher frame rates will make the game too fast. Find Fullscreen=1 and change it to Fullscreen=0. Cutscenes will not play if desktop colour depth is not 16-bit. Add Torment.exe to list of DxWnd applications, and open its properties. Under Main tab, set window size to W=640 H=480 (integer multiples allowed), and check "Terminate on window close". (Optional) Under the Input tab, check "Keep cursor within window". Under DirectX tab, Enable "Compensate Flip Emulation". Find Maximum Frame Rate and change the value to 60. Ambient, Sound FX, Voice, Music and Movie. All dialogues are made of text, therefore there is no subtitle option. 1) Fan translation by ArcaneCost. 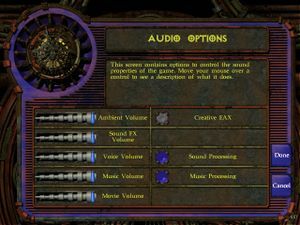 2) Unofficial translation by «Fargus Multimedia» attached as bonus to GOG.com version. Install unofficial patch (DDraw Fix). Go into the control panel in Windows. Switch off hardware acceleration for the duration of your playing time. If the option is greyed out, download the DirectX SDK, and manually switch it off (under DirectDraw). Remember to switch it back on after you are done playing. Go into the video options. There are startup checks that try to ensure the game can run. Usually they involve setting up the initial game. Applies to "F:\Torment\Source\chitin\ChVideo.cpp at line number 4322", or no valid video modes supported. Go to game folder, right click torment.exe and open properties. Under compatability, run in xp mode.